Prostate cancer is one of the leading causes of cancer mortality in Europe displaying a variety of clinical behavior from tumors of low clinical significance to highly aggressive tumors. There is an increasing interest in identifying molecular pathways and genes which can be used as prognostic factors. 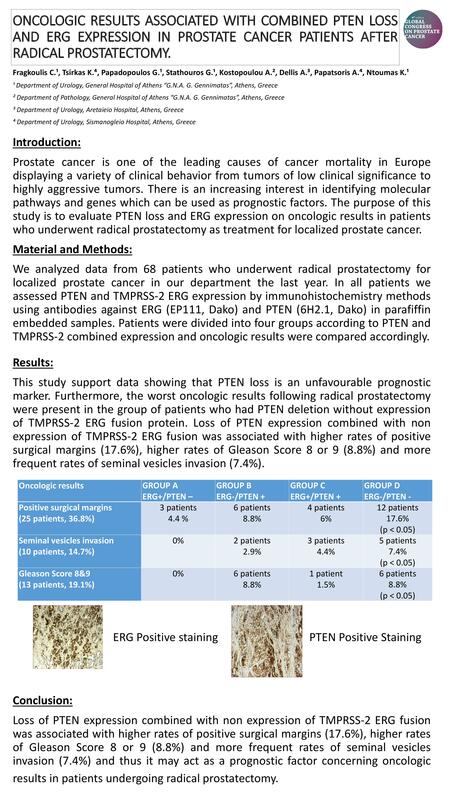 The purpose of this study is to evaluate PTEN loss and ERG expression on oncologic results in patients who underwent radical prostatectomy as treatment for localized prostate cancer. We analyzed data from 68 patients who underwent radical prostatectomy for localized prostate cancer in our department the last year. In all patients we assessed PTEN and TMPRSS-2 ERG expression by immunohistochemistry methods using antibodies against ERG (EP111, Dako) and PTEN (6H2.1, Dako) in parafiffin embedded samples. Patients were divided into four groups according to PTEN and TMPRSS-2 combined expression and oncologic results were compared accordingly. This study support data showing that PTEN loss is an unfavourable prognostic marker. Furthermore, the worst oncologic results following radical prostatectomy were present in the group of patients who had PTEN deletion without expression of TMPRSS-2 ERG fusion protein. Loss of PTEN expression combined with non expression of TMPRSS-2 ERG fusion was associated with higher rates of positive surgical margins (17.6%), higher rates of Gleason Score 8 or 9 (8.8%) and more frequent rates of seminal vesicles invasion (7.4%). Loss of PTEN expression combined with non expression of TMPRSS-2 ERG fusion was associated with higher rates of positive surgical margins (17.6%), higher rates of Gleason Score 8 or 9 (8.8%) and more frequent rates of seminal vesicles invasion (7.4%) and thus it may act as a prognostic factor concerning oncologic results in patients undergoing radical prostatectomy.